Before the addition was added on two years ago, Luke and Elizabeth used to share a bedroom. They had a set of bunks in there, but they usually preferred to share a bed as well. When Luke was finally presented with his own room, he loved everything about it…except sleeping alone. For a while there Elizabeth had mercy on him and would come in and sleep with him, but eventually she decided she was just too old for that and Luke was on his own. And oh, the lonely hardship he so vocally suffered. He more or less got used to sleeping alone, but he never liked it. We tried to get one of the dogs to stay with him, but they want to be outside at night. Finally I asked him if he would like to have a small breed of puppy, to sleep with him and be a little friend when Elizabeth doesn’t feel like playing with him. Luke said no, he wanted a cat. I had mixed feelings about this. On the one hand, our dogs see cats as food, not family. I wasn’t sure we could convince them not to eat any small animal we brought into the house. On the other hand, we really need a cat or two. Gericault and Brodie keep our property admirably free of squirrels and rabbits, but apparently hunting mice is beneath them; I’ve had to start putting rat poison in the cupboards. So, a mouser or two would be very welcome here. When I heard that a friend of a friend had a cat that had just produced an unwanted litter of kittens, I made a spur-of-the-moment decision to let them know I’d take a couple (Elizabeth wanted one too, and kittens seem to do better in pairs) when they were old enough to leave their mom. And Saturday that long-awaited call finally came! So yesterday, after church and before our Sunday dinner, I took the kids over to pick out their new babies. Choosing turned out to be pretty simple. 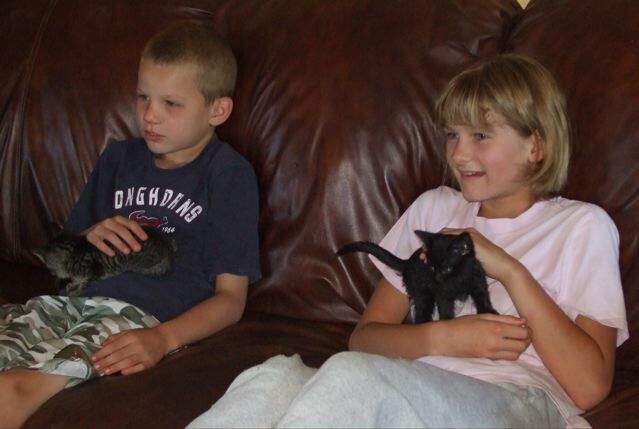 I asked the kids to please try to fall in love with female kittens, because they make better mousers than male. 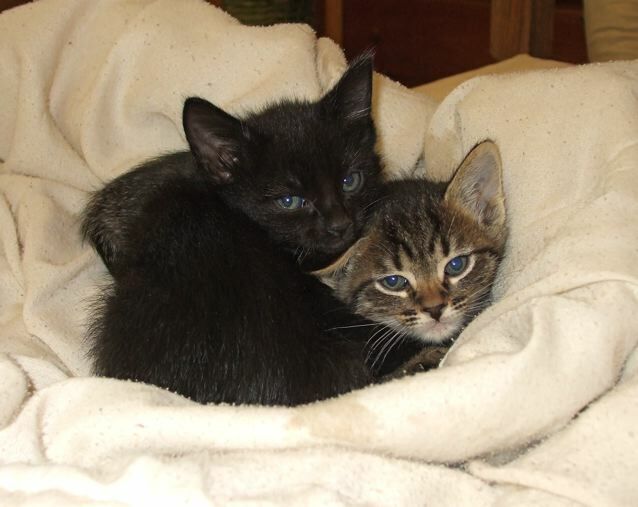 Turns out all the kittens were an identical jet black but one, a little striped tabby that Luke was immediately smitten with. He chose that one and Elizabeth chose the only other female in the litter. 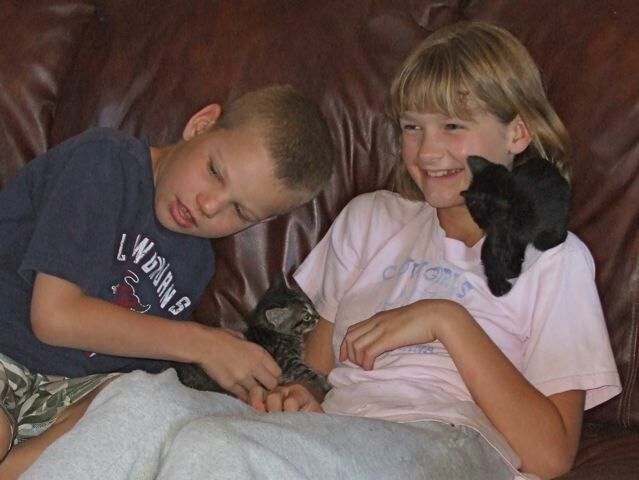 When we got them home, the first thing we did was introduce them to the dogs. Gericault apparently assumed that I was offering him a snack, and matter-of-factly helped himself to Soot. My thundering yell of “NO! !” made him drop her in confusion, and I smacked his nose for good measure. This was a bitter blow to Gericault’s deeply sensitive soul, and for a while after that he pretended to be completely unaware of the kittens’ existence. If I put a kitten right in front of him, he would turn his head away and study the artwork on the walls or whatever. Brodie seemed to grasp right off that the kittens were off-limits, and he’s shown no interest in them at all since the introduction. So far so good. 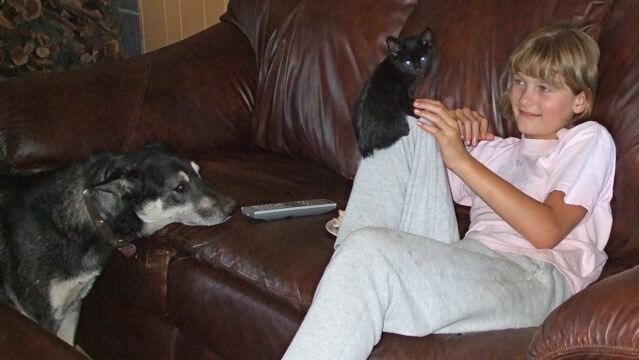 We shut the kittens in the back of the house while we ate supper, and then the kids brought them out to snuggle on the couch while they watched a Looney Toons dvd. This eventually proved to be too much for poor Gericault, who is not prepared to give up his position as Family Snuggler-In-Chief. But he managed to restrain his jealousy and not do anything antisocial. The kids love having the kittens to sleep with, and the kittens seem to be settling in pretty well. Other than a mild case of sticker shock when I saw what high-quality kitten food costs these days, I have no complaints. I suppose the real test will come when we start letting the little tykes have the run of the house and Gericault inevitably finds himself alone with them one day, but so far everyone’s getting along fine. Find the mice, kitties. Tasty tasty mice! Real cats don’t need no stinkin’ cat food! I’ve been told that even without them actually catching the mice and rats that the scent of there being a cat in the building will drive the rodents away. I think it must work because even though I have a big woodpile behind my studio apartment and have seen rats and mice in there, I’ve never seen a sign of them inside where my cat resides. Thanks everyone. :^) Jera, I’ve had the same experience with the mere presence of cats keeping mice out of the house; my hope is that when they’re bigger they’ll patrol the sheds and grounds and at least partly feed themselves on the plentiful rodent population. It seems silly to spend a fortune on catfood when the place is teeming with gophers and mice and such. I wish I had that luck! We have all sorts of neighbourhood cats. They even have taken to using part of my front lawn as a catbox! We had a heck of a time getting rid of the mice in our house. We finally found that they were living in the couch that was left behind for us. And the last occupants had dogs! Mia, I’m always surprised whenever anyone says Elizabeth looks like me. I don’t see a resemblance; I think she takes after the Silkotch side both physically and in her personality. People who know my ex-in-laws (ex-laws?) often comment on it. Now LUKE is the spitting image of my brother, he definitely got the Fosmo genes.